Comments Off on Mantadia Andasibe Reserves….after running the gauntlet on the main road. Mantadia Andasibe Reserves….after running the gauntlet on the main road. We drove out of town the next morning. 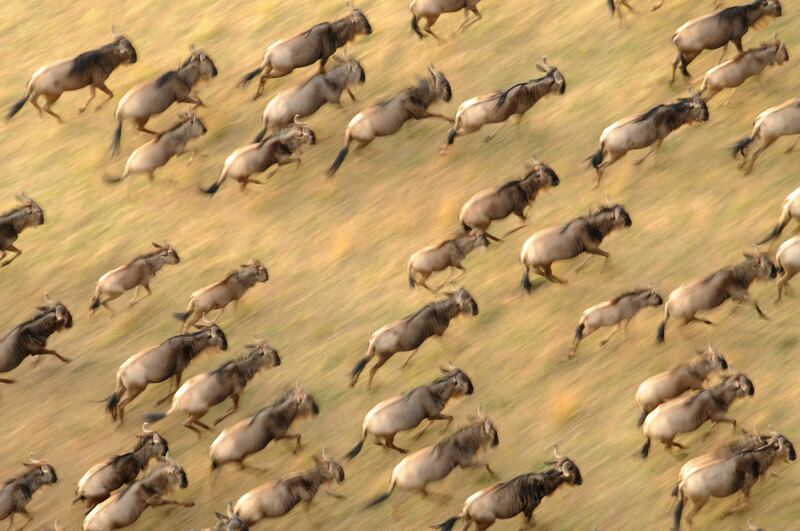 The reserves lay about five hours further north-east from Tana, and Vakona Lodge was our destination that day. The traffic was horrendous, and fortunately our driver, Tanzum was a mind-reader (being able to anticipate the on-coming drivers’ intentions) and we made it safely. We stopped at a reptile park along the way, and were able to see and photograph some of the rarer and rarely seen animals and reptiles of the forests. 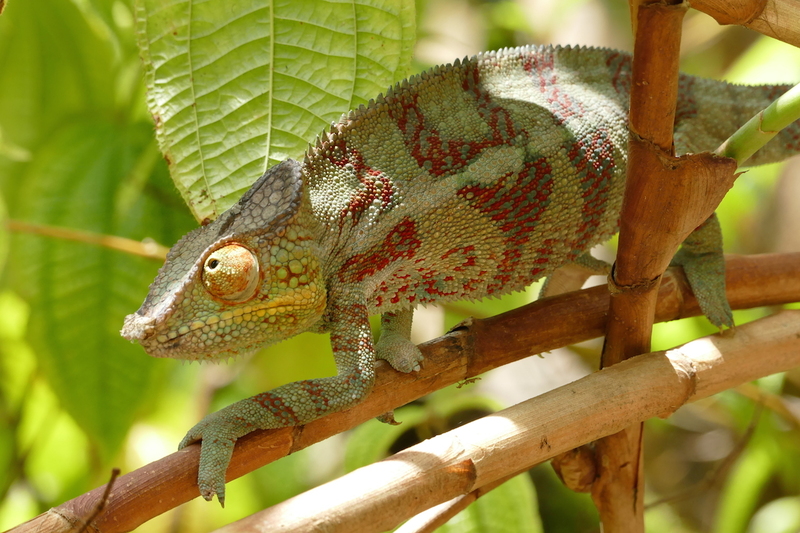 Male Panther chameleons change into brilliant colors during the breeding season. This is demure by comparison. 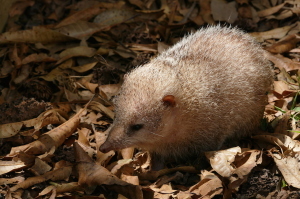 This unique little animal, the Spiny tenrec is confined to Madagascar, foraging on the forest floor at night. 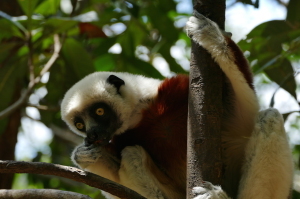 The first Coquerel’s sifaka’s also appeared here, and a host of chameleons, geckos and even snakes. It was an advantage to see these here as in all the reserves it will be hard to find these creatures, so at least we knew more clearly what to look for. The tenrecs, geckos and Langaha snake in particular were really interesting to me. Vakona Lodge is located far in the forests near the reserves. 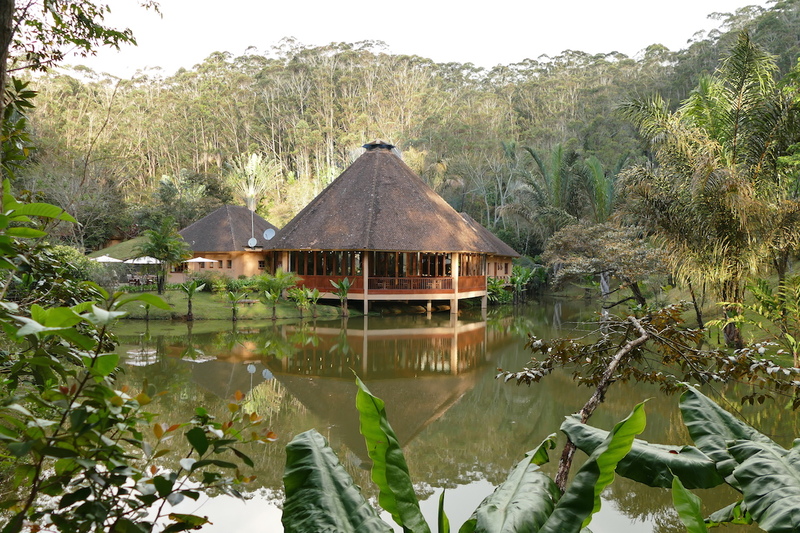 The lodge was high in the forest belt, and prettily located in a landscaped garden only 20 minutes from the reserves. We went on a night walk and located an Eastern woolly lemur, Goodman’s mouse lemur and a small frog. I was singularly concerned at the lack of life in the forest! The next morning we walked with our local guide into Mantadia forest reserve, with a tad more success! 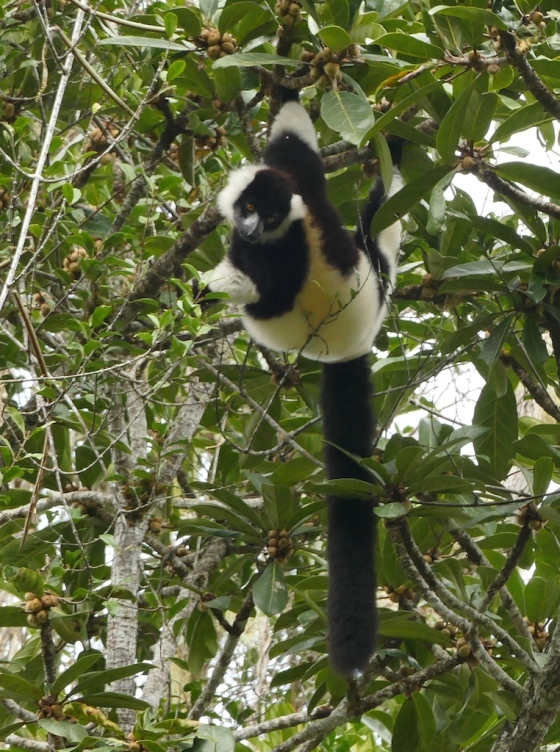 Black & white ruffed lemurs were feeding on figs at the very top of a forest fig, high above us, their smart thick-furred coats at contrast with the greenery. 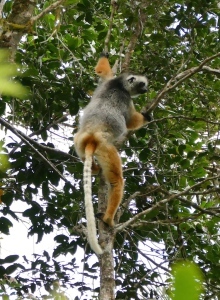 Diademed sifakas showed themselves as well. A blue coua briefly flashed his presence at us, a writhing centipede in its’ bill. The Birds’ Nests ferns and Pandannis were huge in their presence, each creating safe hiding places for a number of small creatures. Moss and primitive plants coated many of the tree boles, and their massive buttress roots formed sheltered areas big enough even for me to hide behind. 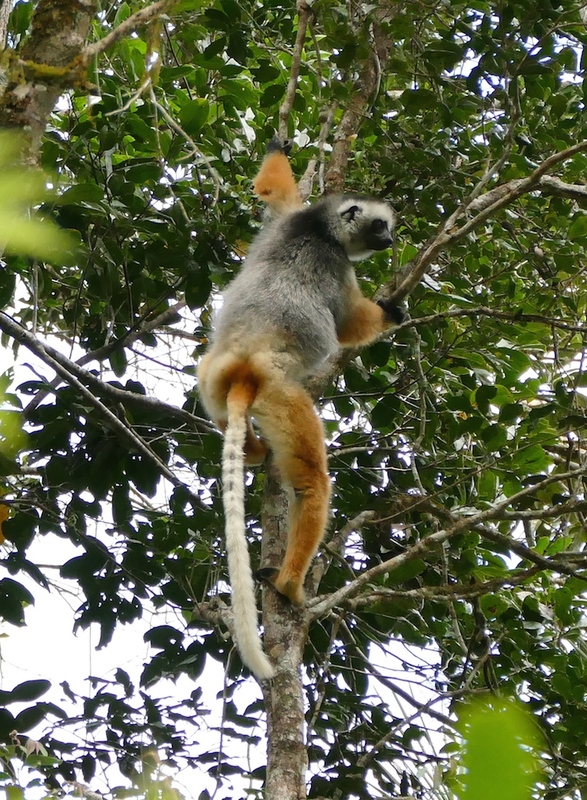 Coquerels’ sifaka is a strikingly handsome animal, and we found them in many forests. A small picnic lunch next to a small body of water in the forest, surrounded by dark, shiny green millepedes in their legions quietly going about eating plant detritus….and then we returned to the lodge. ← The worlds’ 4th largest Island…Madagascar.